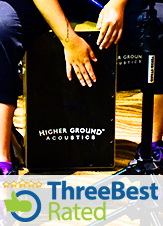 Synergize with others and energize with power from on high amidst each strike on the Cajon. Proclaim the will of Heaven with every touch for purposeful and impactful worship. The Believer Cajon Program™ is crafted to equip individuals to add rhythm and groove in personal and small-group worship settings. Be amazed by the power within you to inspire new life in others...We'll take you there.